Our world is changing rapidly, and one of the new and challenging things is knowledge co-creation in the form of citizen science. So what is it? Citizen science is a relatively new way of knowledge co-creation, where professional scientists and enthusiastic citizens collaboratively search for answers. While it certainly presents challenges, it also provides a great opportunity for both parties to engage science and nature together, and ultimately, can result in transformative societal changes. This video showcases the different levels of participation available, and the advantages of, citizen science when researching biodiversity, by illustrating it with a compelling and intimate visual journey through the seas to the backyard. The research for this film was initiated and financially supported by ALTER-Net, Europe’s ecosystem research network of excellence, within its AHIA program. The video was created by Hanna Carlson and Bori Mészáros. Bela, G., Peltola, T., Young, J. C., Balázs, B., Arpin, I., Pataki, G., Hauck, J., Kelemen, E., Kopperoinen, L., Van Herzele, A., Keune, H., Hecker, S., Suškevičs, M., Roy, H. E., Itkonen, P., Külvik, M., László, M., Basnou, C., Pino, J., and Bonn, A. 2016. 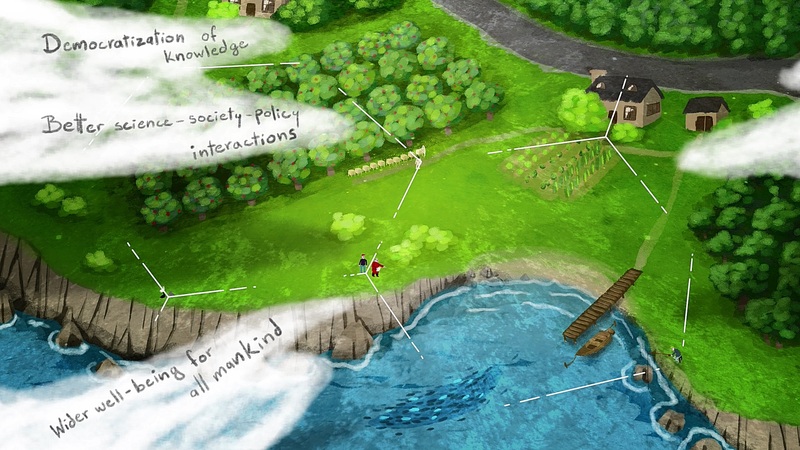 Learning and the transformative potential of citizen science. Conservation Biology 30: 990–999. Conrad, C. C. and Hilchey, K. G. 2011. A review of citizen science and community-based environmental monitoring: issues and opportunities. Environmental Monitoring and Assessment 176: 273–291. Cosquer, A., Raymond, R., and Prevot-Julliard, A-C. 2012. Observations of everyday biodiversity: A new perspective for conservation?. Ecology and Society 17(4): 2. Devictor, V., Whittaker, R. J., and Beltrame, C. 2010. Beyond scarcity: citizen science programmes as useful tools for conservation biogeography. Diversity and Distributions 16: 354–362. Evans, C., Abrams, E., Reitsma, R., Roux, K., Salmonsen, L., and Marra, P. P. 2005. The Neighborhood Nestwatch Program: participant outcomes of a citizen-science ecological research project. Conservation Biology 19: 589–594. Haklay, M. 2013. Citizen Science and Volunteered Geographic Information – overview and typology of participation. In Crowdsourcing Geographic Knowledge: Volunteered Geographic Information (VGI) in Theory and Practice, ed. D. Z. Sui, S. Elwood, and M. F. Goodchild, 105–122. Berlin: Springer. O’Sullivan, E., Morrel, A., and O’Connor, M. A. 2003. Expanding the boundaries of transformative learning: essays on theory and praxis. New York: Palgrave Macmillan. Rotman, D., Preece, J., Hammock, J., Procita, K., Hansen, D., Parr, C., Lewis, D., and Jacobs, D. 2012. Dynamic changes in motivation in collaborative citizen-science projects. In Proceedings of the ACM 2012 Conference on Computer Supported Cooperative Work. 217–226. New York: ACM. The Joint Programming Initiative a Healthy Diet for a Healthy Life (JPI HDHL) welcomed about 240 people to its 5th international conference on the 20th of February 2019 in Bozar, Brussels. After laying the foundations for designing successful co-creation projects in 2018, the Fit4Food Budapest community is up for a fruitful 2019. We kicked off the year together with community members from various parts of the local food system. Dynaversity I Annual meeting took place on January 15th and 16th in Budapest, in the lecture rooms of the Impact Hub Budapest and at the Central European University.